Steaks, burgers, and sausage might be the MVPs of your grill; we won’t steer you otherwise. But why not let watermelon be a pinch hitter in your warm-weather grilling repertoire? Hey, you can even have your sausage with it, albeit more condiment-style than main attraction. 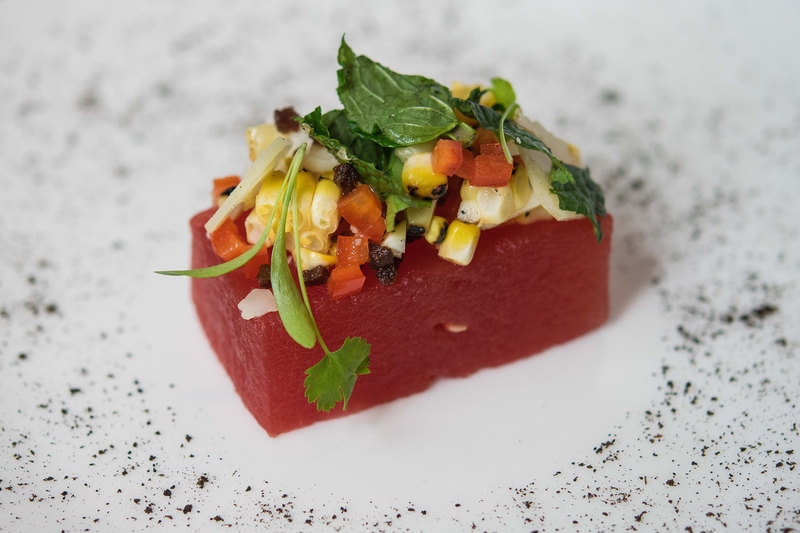 Here, in UNI Chef and Partner Tony Messina’s recipe, fresh corn serves as a happy mediator between sweet watermelon, tangy feta, and savory chorizo. The Boston-based chef adds a generous glug of lime juice and fresh Thai basil to round out the mix, but feel free to get creative and swap Thai basil for mint or cilantro, and lime juice for equal amounts lemon juice or a generous splash of your favorite vinegar. Fatty sausage + grilled corn + juicy watermelon. What are you waiting for? Grab your tongs. 2 pieces chorizo, crumbled and rendered until crispy. Reserve the rendered fat. Place the lime juice into into a mixing bowl. Slowly whisk in the rendered chorizo fat to make a vinaigrette. Season with salt to taste. Cut the corn from the cob. Lightly toss the corn, feta, chorizo, and Thai basil with the vinaigrette. Place the slabs of watermelon on a very hot grill. Leave on the grill until grill marks appear. Grill on all sides. When all sides of the watermelon are grilled, put on a plate and put a quarter of the salad on top of each slab of melon.